Definition at line 139 of file msipriv.h. Definition at line 142 of file msipriv.h. 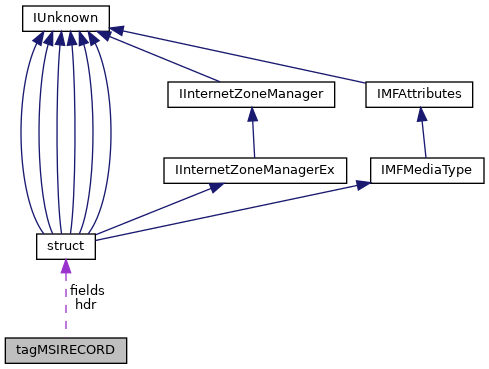 Referenced by dump_record(), MSI_CloseRecord(), MSI_CreateRecord(), msi_record_get_string(), msi_record_set_string(), MSI_RecordCopyField(), MSI_RecordDataSize(), MSI_RecordGetFieldCount(), MSI_RecordGetInteger(), MSI_RecordGetIntPtr(), MSI_RecordGetIStream(), MSI_RecordGetStringA(), MSI_RecordGetStringW(), MSI_RecordIsNull(), MSI_RecordReadStream(), MSI_RecordSetInteger(), MSI_RecordSetIntPtr(), MSI_RecordSetIStream(), MSI_RecordSetStream(), MSI_RecordSetStreamFromFileW(), and MsiRecordClearData(). Definition at line 143 of file msipriv.h. Referenced by dump_record(), MSI_CloneRecord(), MSI_CloseRecord(), msi_record_get_string(), msi_record_set_string(), MSI_RecordCopyField(), MSI_RecordDataSize(), MSI_RecordGetInteger(), MSI_RecordGetIntPtr(), MSI_RecordGetIStream(), MSI_RecordGetStringA(), MSI_RecordGetStringW(), MSI_RecordIsNull(), MSI_RecordReadStream(), MSI_RecordSetInteger(), MSI_RecordSetIntPtr(), MSI_RecordSetIStream(), MSI_RecordSetStream(), MSI_RecordSetStreamFromFileW(), and MsiRecordClearData(). Definition at line 141 of file msipriv.h. Referenced by ACTION_AllocateRegistrySpace(), ACTION_AppSearchComponents(), ACTION_ExecuteAction(), ACTION_MsiPublishAssemblies(), ACTION_MsiUnpublishAssemblies(), ACTION_ProcessComponents(), ACTION_PublishFeatures(), ACTION_PublishProduct(), ACTION_RegisterClassInfo(), ACTION_RegisterExtensionInfo(), ACTION_RegisterMIMEInfo(), ACTION_RegisterProduct(), ACTION_RegisterProgIdInfo(), ACTION_RegisterUser(), ACTION_RemoveFiles(), ACTION_UnregisterClassInfo(), ACTION_UnregisterExtensionInfo(), ACTION_UnregisterMIMEInfo(), ACTION_UnregisterProgIdInfo(), add_stream(), check_column_exists(), create_diff_row_query(), deformat_string(), dialog_create(), event_set_target_path(), get_key_value(), get_product_code(), internal_ui_handler(), is_uninstallable(), iterate_appsearch(), ITERATE_CreateFolders(), ITERATE_DeleteService(), ITERATE_DuplicateFiles(), ITERATE_FindRelatedProducts(), ITERATE_InstallODBCDataSource(), ITERATE_InstallODBCDriver(), ITERATE_InstallODBCTranslator(), iterate_properties(), ITERATE_PublishComponent(), ITERATE_RegisterFonts(), ITERATE_RemoveDuplicateFiles(), ITERATE_RemoveEnvironmentString(), ITERATE_RemoveFiles(), ITERATE_RemoveFolders(), ITERATE_RemoveIniValuesOnInstall(), ITERATE_RemoveIniValuesOnUninstall(), ITERATE_RemoveODBCDataSource(), ITERATE_RemoveODBCDriver(), ITERATE_RemoveODBCTranslator(), ITERATE_RemoveRegistryValuesOnInstall(), ITERATE_RemoveRegistryValuesOnUninstall(), ITERATE_SelfRegModules(), ITERATE_SelfUnregModules(), ITERATE_StartService(), ITERATE_StopService(), ITERATE_UnpublishComponent(), ITERATE_UnregisterFonts(), ITERATE_WriteEnvironmentString(), ITERATE_WriteIniValues(), ITERATE_WriteRegistryValues(), load_folder_persistence(), load_patch_disk_id(), merge_verify_colnames(), merge_verify_primary_keys(), msi_add_records_to_table(), msi_arrange_record(), msi_clone_properties(), MSI_CloneRecord(), msi_create_table(), MSI_DatabaseExport(), msi_dialog_get_uitext(), msi_dialog_oncreate(), msi_dialog_seltree_handler(), msi_file_update_ui(), MSI_FormatRecordW(), msi_get_checkbox_value(), msi_get_property_row(), msi_get_query_columns(), msi_get_query_types(), msi_get_table_labels(), msi_get_transform_record(), MSI_IterateRecords(), msi_load_assembly(), msi_load_image(), msi_load_picture(), MSI_OpenPackageW(), msi_query_merge_record(), MSI_RecordCopyField(), MSI_RecordStreamToFile(), msi_refresh_record(), msi_table_load_transform(), msi_unpublish_feature(), MsiCreateRecord(), MsiDatabaseGetPrimaryKeysW(), MsiGetProductPropertyW(), MsiRecordClearData(), MsiRecordDataSize(), MsiRecordGetFieldCount(), MsiRecordGetInteger(), MsiRecordGetStringA(), MsiRecordGetStringW(), MsiRecordIsNull(), MsiRecordReadStream(), MsiRecordSetInteger(), MsiRecordSetStreamW(), MsiRecordSetStringA(), MsiRecordSetStringW(), MsiViewExecute(), MsiViewFetch(), MsiViewGetColumnInfo(), MsiViewModify(), patch_add_media(), patch_offset_get_filepatches(), patch_offset_get_files(), patch_offset_modify_db(), patch_set_media_source_prop(), patch_set_offsets(), patch_update_filepatch_sequence(), SELECT_insert_row(), SELECT_set_row(), TABLE_add_column(), TABLE_drop(), TABLE_remove_column(), ui_actionstart(), UPDATE_execute(), and WHERE_set_row().